BEMAC is proud to announce the launch of our new EMERGE Professional Development Program. Tailored to support and empower young people who are embarking on the journey of the emerging artist, EMERGE aims to bestow skills, information and insight, while facilitating and supporting the creation of supportive networks and collaborations. BEMAC believes in the power of the arts to transcend social barriers, personal limitations and the constructs that inhibit cross-cultural harmony and understanding. Supporting the creative freedom and expression of young, emerging artists of diverse backgrounds, we believe, is an integral component of building our collective future. In alignment with our parent organisation Access and their mantra of ‘Creating Equal Opportunities’, EMERGE programs and events harness the power of arts and music to empower, upskill and connect emerging artists of culturally and linguistically diverse, as well as Indigenous backgrounds. Providing workshops and professional performance opportunities and support. 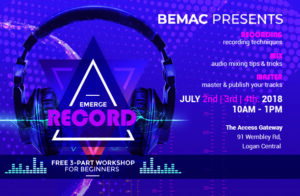 Our first three EMERGE programs will cover DIY home recording (RECORD), singer-songwriting skills (THRIVE) and performance (CULTIVATE). Please find details for all below and simply email admin@bemac.org.au or call us on (07) 3391 4433 to register your interest. Taking place at The Access Gateway during the winter school holidays, RECORD is an intensive 3-day workshop program wherein participants will learn about operating a DAW (digital audio workstation), digital audio technology and terminology, recording digital audio, editing and mixing, mastering and online publishing. 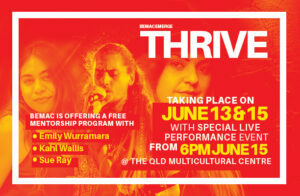 Featuring three of Australia’s most celebrated Indigenous musicians – Emily Wurramara, Sue Ray and Kahl Wallis – THRIVE will engage with Aboriginal and Torres Strait Islander young people eager to establish a career in music. Through workshops and mentorship, THRIVE participants will develop and produce original music, which they will perform alongside workshop facilitators at a special showcase at Queensland Multicultural Centre on June 15. CULTIVATE is aimed at empowering women and girls of refugee and migrant backgrounds through music and skill building. 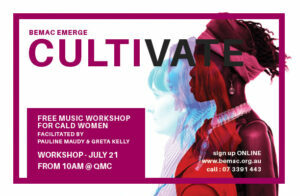 The CULTIVATE program will be led by two award-winning Brisbane-based female musicians – Pauline Maudy and Greta Kelly – who have a passion for world music and believe music has the capacity to heal and sustain people through difficult times.